The single most important thing you can do to avoid landscape project problems is, do your homework regarding state and local environmental laws and regulations so you can clearly understand your jurisdictional restrictions. That means getting to know your town’s conservation agent and being on good terms with the conservation commission. If you don’t have the time or ability to do this, be sure to partner with a knowledgeable, experienced landscape professional that can do it for you. 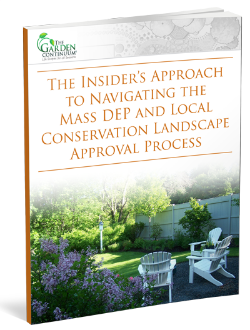 This educational eBook provides advice to residential and commercial property owners with advice on managing the environmental approval process for landscape projects. Today, there is a high likelihood that many Massachusetts landscape construction projects will bump up against either a municipal conservation commission, Massachusetts DEP, or both – especially any projects that are adjacent to public wetlands, watersheds, or other environmentally sensitive spaces. If you are a residential, commercial, industrial, state or municipal construction project manager about to start a potentially environmentally sensitive landscape project, there may be several environmental challenges you need to be aware of depending on the nature of your project. Navigating the regulatory landscape can be daunting. Complete the form to download the insider's Approach eBook instantly!